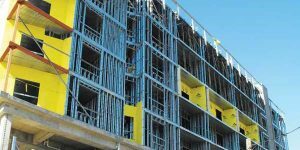 Cold-formed steel (CFS) has been available in construction for more than a century, but some specifiers, architects, engineers, and other building professionals do not yet understand the full range of the material’s benefits and applications. Lightweight, strong, noncombustible, and easy to install, it is versatile enough to address many common obstacles (such as code, time, and cost restrictions) faced by specifiers and other building professionals. In addition to material consistency, the logistical benefits of cold-formed steel extend from the manufacturing process to installation on the jobsite. Many CFS products are manufactured to suit specifications ensuring they fit seamlessly within a building. Manufacturers can pre-cut members to exact lengths—frequently within 1.6 mm (1/16 in.). This reduces waste both during production and on the construction site. Once materials arrive at the jobsite, this combination of consistency and tight manufacturing tolerances allows builders to safely and easily construct building modules before installing them. The strength and stiffness of the material enables the construction of whole sections or systems (e.g. roof assemblies) on the ground. Such systems can include bracing, mechanical, plumbing, and sprinkler components, decreasing the amount of work required at high elevation, which in turn increases efficiency and reduces fall hazards. Offsite panelization of cold-formed steel wall and floor systems, when deemed appropriate for a project by the design team, can also reduce onsite labor costs and improve overall project cycle times.